Persistently peddled tourist attractions like the Tower of London, Madame Tussauds, Big Ben and the London Eye are hard to evade when you’re a first- time traveller to London. Amrita Haldipur had savoured every minute of these “touristy" spots when she visited the city in 2011, but wasn’t going to waste time on them again. A month-long trip to London, after several years, gave the 36-year-old ample time to see the city with fresh eyes. A Mumbai-based independent content marketing and communications specialist, Haldipur has always looked at travel as an occasion to reboot. With the whole of last year spent in the behind-the-scenes rigour of launching a consulting business, Haldipur knew she needed to hit pause to refresh. London seemed perfect. There was another reason why London was high on the list. Haldipur was able to time her trip with a short-term photography course at the University of the Arts in the city. “My passion lies in helping brands review their content, fix the roadblocks and redefine the meaning of content. For this, I often use photography and writing as tools to add soul to a brand’s story," she says. “The decision to take up photography came from a desire to improve my sense of creative direction and look at the world through an international lens." A clean slate to learn new things and an inspiring destination as a backdrop made London tick all boxes. 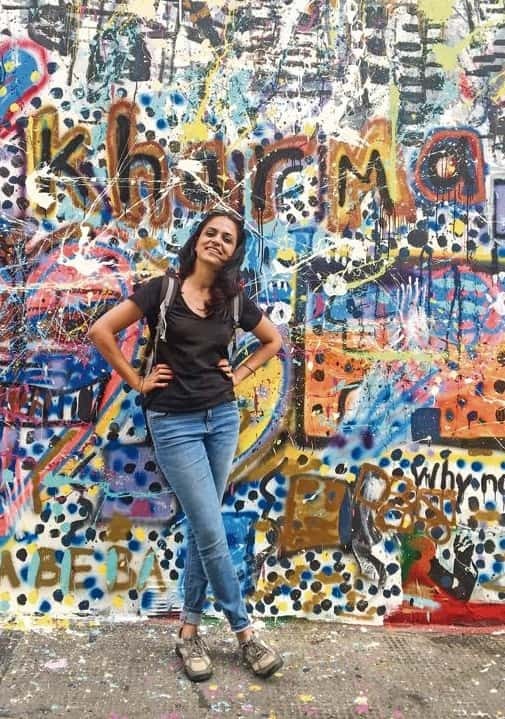 Amrita Haldipur poses in front of a graffiti wall. Managing deliverables and new projects is crucial while planning. Since she was going to be away for a whole month, Haldipur put in extra hours to finish her deliverables of existing projects and paced out taking up new work two months before she embarked on this trip. As a freelance consultant, one is never free of the risk of losing gigs, but London was about taking time off for self-development and restoration. She was willing to let some projects pass, while postponing a few new ones. Haldipur deliberately did not want to carry work to London, as this was a much-deserved long holiday, which she couldn’t spend being tethered to the desk. London is an expensive city. Especially, when you have to account for an entire month. Haldipur saved for over a year, ensuring a full pipeline of work before and after the trip to keep it self-funded. Taking a loan from a family member was strictly out of bounds. “I didn’t want a single ripple of debt to follow my dream and weigh on it, so using year-long savings to fund all the expenses including the tuition fees was the only way to go," she says. Besides, she knew that London has a remarkable amount of free things to do—like visiting Tate Britain or the National Gallery. There are vast tracts of greenery in Hyde Park, St. James Park and her favourite, Epping Forest—all bliss for the eyes and soul and, again, all for free. “I also ended up trying some local apps like Wriggle for exclusive deals on food and drinks, and TicketySplit for train tickets," she says. While the photography course offered a thriving environment to learn, other international students became inadvertent co-travellers to discover the city. London, being a city of imagination, has inspiration around every corner. Haldipur and her friends hit the Camden Market for vintage camera shops and dedicated entire days to museums and art galleries. They scoured the works of Dorothea Lange and Vanessa Winship at the Barbican Centre, the exhibition Shape of Light at Tate Modern, experienced Frida Kahlo’s genius at the Victoria and Albert Museum, and even reserved an evening for a Michael Jackson exhibition at the National Portrait Gallery. The Pride Parade and a Trump protest became memorable backdrops to whet their photography skills. Regular night walks around the South Bank were ideal to see the city wind down. When it came to food, the Kerb Food Festival and many under-the-radar Asian joints stood out from the rest. Her tireless obsession with not visiting tourist traps paid great dividend. Haldipur feels the London trip was the best decision and the most indulgent gift of self-love, both in terms of following her photography dream and rediscovering her favourite city in the world. She highly recommends London to revitalize—a city woven in rich threads of striking antiquity and inspiration.